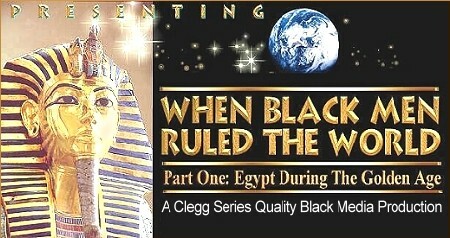 Hosted by Legrand H. Clegg II When Black Men Ruled The World is a classic documentary of little known facts about the black people of ancient history. The documentary discusses the migration, origin, and accomplishments of ancient black people and their obvious impact on the modern world. The Sahara Desert (a once fertile region) in Africa once had a much cooler & wetter climate with many animals, lakes and streams, and was populated by highly advanced black people. For thousands of years the only people on Earth were Africans. They learned to domesticate animals, organize themselves into tribes, and travel the world. The monuments of the ancient Africans serve as the foundation for modern architecture. The ancient Africans developed math, science, and laws. There was no difference between ancient Nubians and Egyptians. Egyptians are the children of the Southern Sudan. The first civilization traveled northward from Nubia into Egypt. There were Pharaohs ruling Nubia long before Egypt became a nation. Also, pyramid building was nothing new by the time Egypt became a nation, the practice was merely refined and perfected by then. Nubian Gods, Osiris and Isis (gods often used in occultism) are always depicted as black. Europeans and Asians eventually settled in lower Egypt, and mingled. The organization of the Egyptian government grew from something as simple as organizing to control the Nile River as it overflowed its banks every year. The women of ancient Egypt did many of the things black men did as well as labor, and were allowed to own property. Some women even grew to be as powerful as the Pharaohs themselves. They also influenced the building of The Great Pyramids. The Ancient Africans developed antiseptics, vaccinations, cures for numerous diseases, and advanced surgical techniques. The scientific biological medical science practices of pharmacology, anatomy, physiology, neurosurgery, and pathology, were started in ancient Egypt. All of the ancient Greeks who made a name for themselves studied in Africa. The first clock was also invented in Egypt. The ancient Egyptians knew the Earth was round, was on a tilted axis, and were calculating seconds.They also had the technology, and ships sturdy enough to sail to the “New World”. America may have simply been a crossroad at some point in ancient history. There is plenty of evidence in ancient Latin American structures that indicate African architectural influence.